...until drowsiness overtook me. Then I’d put that antique Bible back on the shelf until next time. I read the first chapter of Genesis about fifteen times as a teen, but that was as far as I got. When I came to faith as a college student, I discovered the power of God’s Word. Reading a modern translation, I began to understand God’s love for me. 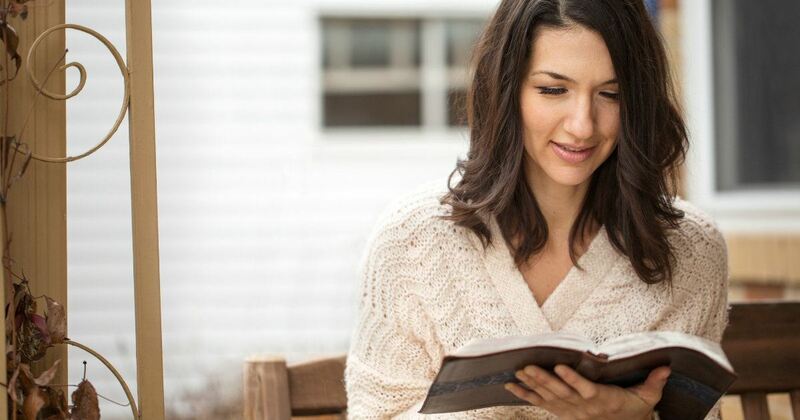 As a desperate young mom years later, I discovered that God’s Word gave me peace and encouragement. When I began to parent teens, I learned God’s Word imparted wisdom and strength. In today’s world, against the backdrop of grim headlines in the news, I find hope on its pages. I find joy that sustains me in my weak moments. To be honest, some days I roll my eyes as I open my Bible with thoughts like these: “I’ve read this passage so many times; there’s no way I can learn anything new from it.” But the Bible surprises me. It speaks to me every time I open it. God’s Word is alive and active because the Holy Spirit brings it to life. Even when I’m reading a passage for the tenth time. The Bible is a living book with a timeless message. The more we read it, the more God’s words get into us. We get to know God better. We find wisdom and guidance for how to deal with our crazy lives. We find peace for our troubled times and hope for our hard moments. Although I fell asleep reading Genesis as a teen, I now marvel at how it sets the foundation for understanding who God is and how He relates to man: “God created man in His own image, in the image of God He created him; male and female He created them” (Genesis 1:27). The stories of how God created the world and chose a people for Himself help us understand the rest of Scripture. In Genesis, for example, we find the first prophecy regarding Christ’s coming, right after Adam and Eve sinned in the garden. This book tells us dramatic stories: Abraham and Sarah having a child in their old age, the miraculous provision of a wife for Isaac, and Jacob’s two wives battling for his favor. We read about Jacob’s jealous sons selling their brother Joseph, their father’s favorite, into slavery, and how God ironically used Joseph to save them from famine later. John helps us get to know Jesus better. Many of us love this book for its beautiful, inspiring language and for the picture it paints of Jesus and the relationship we can have with Him. We find hope and inspiration from Jesus’ “I am” statements: “I am the Bread of Life” (John 6:35), “I am the Light of the World” (John 8:12), “I am the Good Shepherd” (John 10:11), “I am the Resurrection and the Life” (John 11:25), and “I am the Way, the Truth, and the Life” (John 14:6). More mystical and philosophical than the other three gospels, John gives the most convincing argument in favor of the supernatural identity of Jesus as the Son of God. John alone calls Jesus the Word of God: “The Word became flesh and made His dwelling among us” (John 1:14). John states his purpose for this book: “that you may believe that Jesus is the Messiah, the Son of God, and that by believing you may have life in his name” (John 20:31). Masterfully written by the apostle Paul, Romans presents a convincing argument of why we need a Savior. We often quote verses from Romans to share the gospel: “But God demonstrates his own love for us in this: While we were still sinners, Christ died for us” (Romans 5:8). My favorite passage in the whole Bible, chapter 8 contains so much uplifting truth in 39 verses. At least once a year, I take four or five days to read and absorb it. If you want a simple handbook on prayer, turn to the Psalms. They teach us how to relate to God in all circumstances. They express lament, praise, joy, and despair. We can find Psalms that meet our need to grieve, confess sin, ask God for guidance, or express joy and thanks. I’ve read a Psalm each day for most of my adult life, and of all the books of the Bible, Psalms has influenced me most profoundly. The words have become familiar. I turn to the Psalms when I’m too upset or distracted to read anything else. When life turns me upside down, I remember, “God is our refuge and strength, an ever-present help in trouble” (Psalm 46:1). When I’m scared, I remind myself, “He who dwells in the shelter of the Most High will rest in the shadow of the Almighty” (Psalm 91:1). During a low point in my life, I memorized the opening verses of this book to remind myself of the many reasons I had to be grateful. Paul’s letter to the Ephesians begins with an inspiring description of the blessings and grace that are ours in Christ, and I always return to it when I need reassurance. Ephesians reminds us we are saved by grace through faith in Jesus Christ alone. It contains a powerful reminder of our identity and purpose: “For we are God’s handiwork, created in Christ Jesus to do good works, which God prepared in advance for us to do” (Ephesians 2:10). This book also covers topics helpful for Christian living, like unity in the body of Christ, counsel for husbands, wives, and families, as well as how to engage in spiritual warfare so we can stand firm in our faith. If you need wisdom or just a general “How-to-Do-Life” manual, read Proverbs. Solomon’s book of short, pithy statements gives us timeless truth for effective living. This is why many of our grandparents grew up hearing Proverbs read at the breakfast table. In it we find sound advice for everything from relationships, marriage, and family to work and money. Proverbs teach us about self-control, wise speech, planning, justice, leadership, success, and love. The opening chapters of the book explain the importance of wisdom for living, and describe both the benefits of wisdom and how to attain it. The most important message of the book is this: the foundation of all wisdom is to honor and obey God. “The fear of the Lord is the beginning of wisdom, but fools despise wisdom and discipline” (Proverbs 1:7). When life gets us down and joy all but disappears, Philippians encourages us to look beyond our circumstances and find joy in Jesus Christ. In just four chapters, Paul mentions joy or rejoicing sixteen times; in fact, simply remembering that Paul wrote this joyful letter from a Roman jail reminds me that maybe my life isn’t as bad as I think. If he could say, “Rejoice in the Lord always,” surely I can too (Philippians 4:4). I also appreciate this guidance on how to handle worry and anxiety: “Do not be anxious about anything, but in every situation, by prayer and petition, with thanksgiving, present your requests to God. And the peace of God, which transcends all understanding, will guard your hearts and your minds in Christ Jesus” (Philippians 4:6-7). God used 1 John to lead me to Christ when I was eighteen years old. As I read these verses, the Holy Spirit brought them to life, and suddenly the gospel became clear to me: “This is how God showed his love among us: He sent his one and only Son into the world that we might live through him. This is love: not that we loved God, but that He loved us and sent his Son as an atoning sacrifice for our sins” (1 John 4:9-19). When we need a reminder of God’s love for us, 1 John encourages us with its many affirmations of His amazing love. In just five chapters, John touches on themes of light, victory in Christ, fellowship with God, forgiveness for our sins, and assurance of eternal life. When I polled a group of 50 friends about their favorite books of the Bible, it surprised me how many of them mentioned James. But when I took a closer look, I remembered the practical wisdom James offers. “The wisdom that comes from heaven is first of all pure; then peace-loving, considerate, submissive, full of mercy and good fruit, impartial and sincere” (James 3:17). This short book challenges us to take practical steps towards acting out our faith, instead of just talking about it. James begins with special encouragement for people undergoing trials and for those who need wisdom. It continues with sage advice on listening before speaking, obeying God’s Word, taming our tongues, and showing generosity to the poor. Written about 700 years before Christ, Isaiah foretells the coming of the Messiah, God’s anointed servant. It gives several specific prophecies about Jesus: that he would come from David’s line, be born to a virgin, suffer for our transgressions, and rule eternally. This book gives Jesus the names of “Wonderful Counselor,” “Mighty God,” “Everlasting Father,” and “Prince of Peace” (Isaiah 9:6). Like many Old Testament prophets, Isaiah can be challenging to read because of its strong words of judgment against disobedience and sin. Yet it also gives us a beautiful picture of God’s holiness, majesty, compassion, and His plan for redemption. Isaiah offers powerful words of encouragement and comfort, like these: “Those who hope in the Lord will renew their strength. They will soar on wings like eagles; they will run and not grow weary, they will walk and not be faint” (Isaiah 40:31).